The internet is flooded with this disgusting story about a naked man who chewed off the face of another man. Authorities say he may have been under the influence of “bath salts”, which is a drug referred to as the new LSD. This horrible attack happened Saturday and was caught on surveillance. The footage is tough to see because there’s a bridge blocking it, but you won’t want to see the real thing after looking at the pictures below. Police ended up shooting the attacker several times, once in the head, to stop him. Larry Vega witnessed the attack on Miami’s MacArthur Causeway. 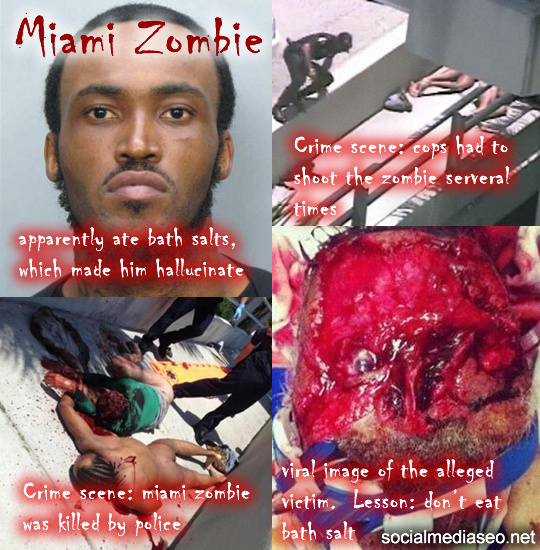 He told CNN affiliate WSVN he saw one naked man chewing off the face of another naked man. “When the officer approached him, told him to stop, pointed a gun at him, he turned around and growled like a wild animal and kept eating at the man’s face,” Fraternal Order of Police President Armando Aguilar told CNN affiliate WPLG. Here are some pictures that are floating around the internet regarding the attack. They are graphic, so please don’t look if you have a problem. Here is another picture of the crime scene. Again, another graphic and disgusting picture. It’s all a lie! Zombies brosefs! We gotz to get armed and ready! It’s da apocalypse! 2012!!!!! If it was bath salt, that would mean everyone who has been exposed to it is now slowly turning into a zombie because it has soaked into their skin. Ha, think about it. If bath salt has that effect on someones mind what is it doing while it’s soaking into your skin. Ok so yall tell me i need boards and nails !!!!!! Lol what is the world coming to.i mean i heard of dog eat dog world and now its come to man eat man wow !!!! The zombie apocalypse has begun!!!! I guess u could say we are living in the last days cuz that rite there jus let me kno hell is rite here on earth!!!! SMH SCARY AND LAST BUT NOT LEAST EWWWW!!! HE HAD TO B HIGH OR SUMTHING LIKE IT!! Damn…. And i thought weed gave people the wicked munchies…. I have always been fascinated with zombies ever since watching The night of the living dead about 25 years ago when I was 7 and all the way up to the AMC THE WALKING DEAD show but I never dreamed of a real zombie apocalypse. Insane…………the damb drugs ruinin this world. Now not that meth isnt bad enough making people crazy they come out with a damb super meth that this time turns a man into a zombie who knows what next time could be. And i swear for this excpecially thete shouldnt be a ” i was on drugs” defense. Im sick of that they know there taking the drugs n that you can react in all kinda ways so they knoe ahead of yime there a danger to themselves n others most likely. Full on attepted murder one no plea deal n excuses bottom line. N not just for this guy like they always do make an example,then dlowly let others off with lesser charges. 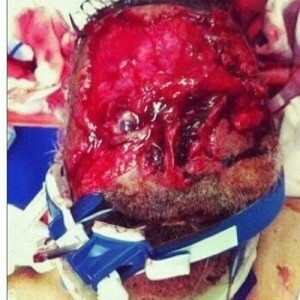 Poor man could u imagine the pain n fear my God, thsnk God hes alive!!!! Horror movies coming t real life. Why would you eat frickin bath salts in the first place? wow i never seen nothing like this in my life i only thought this tpye of stuff happen on movies in thats it may god bless the man in the hospital hes always in my prayers…………. They did not find any bat salt in his system or anything else besides weed. So now their trying to say that weed could’ve done it cause they have no other explanation for his actions. What BS. They know exactly what’s going on but that’s the government for you.